Francois CORMIER, his wife, 1 boy, 1 girl. Michel POIRIER, his wife, 1 girl. Michel GIROUARD, widower, 2 boys, 5 girls. 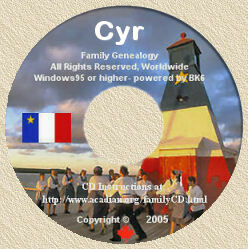 I am grateful to Joe Crochet who provided the above-noted information for the... "In Search of Our Acadian Roots" CD-ROM ©1994 (now available in Windows Version). The original census can also be found on microfilm C-2572 of the National Archives of Canada.